Our tour of Bangkok was just perfect. We are a family of 6 and were quite jet lagged. Ang Mo tailored the day for us and it ended up being our best day in Thailand. My wife and I spent two days with Angmo touring Bangkok and the surrounding areas. She was knowledgeable, caring, and kind, and we would highly recommend her as a guide and companion. She speaks English very well, and showed us many local places we would never have discovered on our own. Fantastic !!! Angmo is such a terrific guide but more importantly she is a warm and compassionate human being that knows how to best share the treasures of Thai life and Buddhist culture and faith. Our two days with her in Bangkok were nothing short of spectacular. We highly recommend touring with Angmo. She was a delight! Her communication before and during the tour was fantastic. A Bangkok native, she is knowledgable, funny and warm. She even took pictures of us enjoying the sights. Day 2 we ventured outside the city to experience the floating markets, fantastic food, a tiger sanctuary, and elephant camp. What an adventure! We thoroughly enjoyed our 2-day tour with Angmo. She was a delight! Her communication before and during the tour was fantastic - we had so much fun learning all we could about Thai culture. A Bangkok native, she is knowledgable, funny and warm. She even took pictures of us enjoying the sights. Day 1 was filled with city highlights such as Wat Pho, The Royal Palace, Chinatown, the Flower Market and a boat ride through Bangkok's canals. A great intro to a beautiful city! Highly recommend! This was our second day with Angmo and she was a delight to be with. Our second day saw us leave the downtown core and spend time visit the floating market, hang around with tigers and visit with elephants while getting close and personal with a large python. Again Angmo put together an itinerary that suited us perfectly. We would highly recommend Angmo. Angmo was very pleasant to be with. She put together a great itinerary for our visit to Bangkok. She was very respectful of our preferences and enthusiastic. She was very knowledgeable. We covered a lot of ground in one hot day. Angmo was a fantastic guide who gave us a great day. She had several surprises for us. She also knew all the best spots and angles to take photos in the Grand Palace and Wat Po. This saved a lot of time and we got some great pictures. It was a wonderful day and a wonderful tour. If you are lucky enough to get her for your guide you will be very pleased. I can't imagine anything that could have been better. The Van was very comfortable for the 6 of us and had pretty good wi-fi which was a welcome bonus. Our tour guide Yaowarak is a first rate tour guide in my opinion. During our 2-day tour excursions, she was very enthusiastic, cheerful and took care of all the details of the tours. She speaks fluent English and always had a smile. She talked with us (8 in our group) in every aspects of the local life. She even sang for us and we had a great time. Highly recommended! Excellent experience with Angmo! First class service all the way from the luxury van to the private boat rides. Angmo knows Thailand and provided all the information we wanted to know about Thai culture. She knew where to take us for the most delicious food and best shopping. If you are looking for someone to show you all the best Thailand has to offer with a classy, beautiful, knowledgeable and friendly and perfectly English speaking guide you need look no further! Angmo was better than we could have expected. Her knowledge of the history and culture of the Thai people is without compare. This one was the one thing that I did in Thailand that I would do again without question. The cost is a little higher than other guides but the van you get and the service is worth every penny. This is way you should tour around a city. We were flying back to the US thinking about how much we enjoy our tour with her. Seriously, pick Angmo - she is amazing. We experienced one of the best tours we've ever had & spent an incredible day exploring Bangkok with the most friendly, knowledgable and fun guide we could have ever asked for. Highly recommended! TOUR GUIDE RESPONSE: Dear Greg, Thank you very much for your kind words and great review. It was my pleasure to take you on this one day trip around the highlights of Bangkok. I am happy to know all of you enjoyed it so much! kind regards, Angmo. This was a perfect way to hit all the highlights of Bangkok. Angmo was so friendly and accommodating. She provided lots of interesting facts and history. We received a tailor made itinerary that made for a perfect day. Would highly recommend this tour and especially this tour guide. Fantastic tour, she was a very friendly and knowledgeable guide. Great with our daughters. Angmo's two day Bangkok tour was AMAZING! My boyfriend and I took her tour for our only two days in Bangkok and we wouldn't have had it any other way. We saw everything we wanted to and Angmo helped design the tour to meet all of our interests. The van was essential to getting around comfortably and efficiently. We would tour with her again and highly recommend her. Yaowarak --Sorry for this delayed review: Yaowarak (Angmo) is a fabulous guide. We have hired her twice in the last few years for our visits to Thailand. Everything about her is outstanding. She is flexible and creative and fun and a pleasure to be with. From Gail and Jerry in the Philadelphia area. TOUR GUIDE RESPONSE: Dear Gail, thank you for your kind review and for being a returning guests for me. It's always great to meet my old guests again and introduce them to more of Thailand. So meeting you again was a treat for me as well. I hope to see you again for more :-) kind regards, Angmo. We had a fantastic day with Angmo. We went to the Maeklong train market, floating market and Thai house and finished with great lunch at a local restaurant. Meeting Angmo and her friends really gave us a great day - definitely recommend any tour with Angmo who is a great tour guide and very knowledgeable - wish we had the more time. Wonderful tour of Bangkok! Angmo is energetic and very knowledgeable. Highly recommended, first class operation! Our family only had one day in Bangkok couldn't have asked for a better tour. My wife and I enjoyed our time in Bangkok and the visit with our guide, Yaowarak. The luxury van was a surprise. Visits to the Royal Palace , the flower market and the Wat Pho were very good. The most wonderful part of the trip was the private boat trip through the canals of Bangkok. The gifts given to us by our guide was a lovely touch. We were surely use our guide again when we return to Bangkok. Fantastic 2-day tour with Angmo... a great customized itinerary for us. She is so knowledgeable about all the history & culture & Special places... very fun and friendly. We will contact her again when we visit Bangkok next. We had an absolutely lovely day tour - when we work up that morning to an uncharacteristic rainy day we were worried this would spoil our day - not at all. Our tour guide put us at ease straight away and everything went very smoothly and she even adjusted the programme to allow us to play with tigers instead of elephant rides. We would thoroughly recommend the tour and it suited all 3 children aged 10 to 17 with us all trying to sing along to the Bangkok song on the bus! Angmo is a star. Engaging, energetic and well organised. Airconditioned mini van with leather seats followed us around, allowing dress up for the Royal Palace and dress down for the heat of the day. Private klong boat tour with food to feed the myriad of canal fish. Rapid (nice) afternoon tour of Flower Market and Chinatown with selected street food. Angmo buys all the entrance tickets and settle up boat/entrance at the end. Nice restaurant lunch on Democracy Sq. Jim Thompson tourist trap over-rated. Angmo is absolutely wonderful, accommodating and professional in every way. Over the course of the two days we spent with her, she was extremely knowledgable and personable. Communication was seamless. Referred other travelers in Chang Rai to Angmo's associate, Tommy, as she was unavailable and when we reconnected in Bangkok their feedback was equally as favorable. For a first time visitor to Bangkok, the tour is a must! Angma was an amazing guide. You can tell she cares a lot about sharing her culture. She is very friendly and knowledgeable. Two days with her was too short!! If you are in Bangkok take her tour!! My husband and I spent three magical days in Bangkok with Angmo as our guide. She designed a tour for us that covered many different sites in a very well-planned manner. We learned a lot about Thai history and culture. Thank you Angmo for making our three days very memorable! Wonderfully flexible tour, Angmo understood our interests and adapted our program accordingly. And she managed to make even Bangkok 's traffic jam tolerable, using the time to tell us stories and give us information. Thank you, we had fun! Very sweet guide. Good tour. This was the BEST tour I have been on! Our tour guide Angmo was sweet, knowledgeable, fun and attentive. She customized the private Bangkok tour to our liking and adjusted the tour the day of due to timing. She knew the best spots for pictures and was great at keeping up on track with getting in and out of places. I was HIGHLY recommend anyone going to Bangkok to book a tour with Angmo. She is fabulous and such an easy person to have as your tour guide!!! Very personable, knowledgeable, flexible to our needs, constantly took pictures of our entire party at key photo opts, English skills great, always pointing out the best pit stops available (very important), "Great tour guide"
We had an amazing time thanks to Angmo our guide and mr.Sweet our driver. Angmo's knowledge of the city and history of Thailand was superb. Also her English is excellent and combined with a friendly personality made for an amazing experience. Her passion for Bangkok and Thailand was contagious and she was able to address all of our questions and keep us informed not only of historical significance of what we were seeing but also the current way life in the country. We spent 6 days touring with Angmo, and it was truly phenomenal. Each day was tailored to our preferences. We felt like we were seeing Thailand through the eyes of a local, discovering gems such as lotus farms and truly authentic Thai restaurants. Angmo taught us so much about the culture and history, and it was so reassuring having her navigate us through the open markets, translating for us and selecting the best vendors from whom we could make our purchases. She is sweet, funny and the perfect guide!!! Angmo was absolutely fabulous, completely flexible, intelligent, knowledgeable, personable. Two of our eight travelers were difficult (one nearly impossible and very rude) and Angmo was a real lady about it. If I* lived in Thailand, she would be my friend. TOUR GUIDE RESPONSE: Hi Keri, Thanks for the happy times and your 5 star review! Enjoy the rest of your stay in Thaiiland! Kind regards, Angmo. Angmo (as she is called) gave us a terrific two day tour . We had never been to Bangkok and wanted an introduction to the city and all its wonderful sights. We were driven in a luxurious and comfortable van with an unlimited supply of cold water and icy towels (which we really needed), and were treated to street food, lunch on the second day, and the services of a terrific photographer (Angmo) who knew exactly where to take every shot. Loved the tour - highly recommend. With our guide Angmo(Yaowarak) we spent eight fun hours exploring the Grand Palace , Temples , the flower market and a boat ride along the canals of Bangkok. Angmo is an English speaking guide and she got the mix between information on the history ,religion and fun exactly right and we would highly recommend her. Although we were out for eight hours it was not strenuous as we had transport between the attractions with much needed water and cold towels available each time we got back into the car. TOUR GUIDE RESPONSE: Hi Graham, Thank you very much for your 5 star review and for spending a fun day with me. I enjoyed introducing all the magnificent highlights of Bangkok to you. I wish you a happy and joyful Thailand trip! Kind regards, Angmo. Angmo (Yaowarak) is an excellent guide!! She has a warm personality that helps visitors to understand Thai culture. Her two day package is really good. First day, you visit Bangkok main points of interests; she makes you try local food which is really good and you can also see Bangkok vibrancy through local markets and river ride. For the second day, we chose to go to the historic city of Ayutthaya, which is one of UNESCO World Heritage places. You will find it as a fascinating place. TOUR GUIDE RESPONSE: Dear Helena, Thank you for your positive review and comments about my 2 days tour. It's true that it's the best way to start a travelers journey to Thailand this way. I loved exploring Bangkok and Ayutthaya together with the both of you as well and I hope you enjoyed the rest of your Thailand travels the same as these 2 days in Bangkok with me. Thanks again for your 5 star review and see you the next time in Thailland. Kind regards, Angmo. Amour, Was very good knowledgeable and well aware of my limited mobility unfortunately our ship docked 3 hrs away and our time with her was limited. I think she did great with the time that we had. We highly recommend her. TOUR GUIDE RESPONSE: Dear Maria, thank you for exploring Bangkok with me today! It was my pleasure to travel with you and your family and to show you all the important places in my city! I will wait for all your friends to visit Thailand soon :-) Kind regards, Angmo. He is very kind and cute person. If we could give Angmo (Yaowarak)10 stars we would! She was the most experienced, knowledgeable, organized, friendly, warm, caring and entertaining tour guide we have ever had! If you are privileged and lucky enough to be in Bangkok, do not miss touring with Angmo. She is a gem!! Day 1 was on the 6th Jan 2017. Day 2(24/01) of our itinerary put together by Angmo. Another fantastic day! Ayutthaya was a complete contrast to Bangkok. She simply showed us the best with so much enthusiasm! Again all perfectly timed despite the distance and traffic. Worth a mention is the luxurious transport & courteous drivers who accompany her(constant supply of cold water & wet wipes). You certainly get what you pay for. She is a star! Impressed! Thank you Angmo. She met us at the pier in Bangkok with a great car and driver and spent two days with us as she brought to life all of the wonderful sites with her knowledge and personality. There was so much to see, but she kept a comfortable pace and adjusted our day to suit those things we thought most important. We had a wonderful lunch each day at a local restaurant. We would highly recommend her to anybody needing a guide in Bangkok. It would be hard to find anyone better. Yaowarak, was great. She had a wonderful day planned for us. Could not have been any better. Her english was perfect. Angmo exceeded our expectations. First of a 2-day itinerary to discover Bangkok. Fantastic itinerary covering main sites of the city whilst constantly enticing us with Thai delicacies, street food, sweets you name it! She is assertive, very well organised and brilliant at time management. She is everything I look for in a guide (myself with a guiding career of 35 years I am very critical of guides). She certainly ticks all the boxes. Look no further! TOUR GUIDE RESPONSE: Dear Allan, Thanks for your 5 star review! Kind regards, Angmo. TOUR GUIDE RESPONSE: Hi David, thanks so much fot your excellent review! Kind regards, Angmo. Amazing sightseeing tour in and around Bangkok! We booked the 2 day tailor made tour of Bangkok because we only had 2 1/2 days in the city and wanted to see as much as possible. We were very impressed with Angmo's video on the website, showing that she is a very outgoing person and feels comfortable speaking English. When we met her in person, our expectations were exceeded. Not only did she show us all of the major sights and tell us a lot about her culture, she made us feel like friends. Yaowarak is tops in all categories! In our 3 days of custom touring we found Yaowarak (Angmo) to be highly professional, always timely, fluent in English, always pleasant & happy, knowledgeable of current & historical Thai culture, history & events, easy to work with, full of suggestions to make our tours even more special, considerate of our needs & wishes, and at the very top level of tour guides. We toured around Bangkok by van, boat & Tuk Tuk - all seamlessly. Special tours south to market & north. TOUR GUIDE RESPONSE: Dear David, Thank you for taking the time to write this extensive and amazing review.The 3 days we spend got us to all the best places in and around Bangkok. It was a very happy and engaging time that I spend with you and maybe we'll explore Thailand some more in the future :-) Thanks for visiting Thailand! Kind reagrds, Angmo. We had a great time, perfect guide. TOUR GUIDE RESPONSE: Hi Carol, thanks for your 5 star review and kind words. Kind regards, Angmo. I've used private guides in Spain, France, London, Germany, Japan, Italy and other locations and feel like Yaowarak was exceptional. We felt like a close fiend versus a client. She helped us to love the Thai culture and people. The two days we spent with her were very enjoyable. Angmo was extremely knowledgeable and professional. She made great suggestions and was very personable. We would gladly recommend her to others travelling to Bangkok! Our 2 day tour of Bangkok with Angmo was outstanding!!! Angmo was flexible with our itinerary and guided us through the major tourist attractions as well as the local markets and shopping areas. We thoroughly enjoyed every moment of our time in Bangkok thanks to Angmo ! ANGMO IS EXCELLENT. She is friendly, knowledgeable, caring, charismatic, energetic and a true professional guide. She knows the ins and outs of maneuvering through the huge crowds. We got to see and do everything, it was an amazing experience. TOUR GUIDE RESPONSE: Hi Gari, Thank you so much for your kind words and awesome review! I wish you a great time in Thailand! Kind regards, Angmo. Angmo did a fantastic job with all of the transportation, and arranging the entrance fees to all of the sights, and lunch. She gave us valuable insight into Bangkok history and culture, and gladly took pictures of us. The itinerary was well planned, not too rushed, or too slow, and took into consideration the Bangkok traffic (and heat!). We can't recommend her highly enough. TOUR GUIDE RESPONSE: Hi Mark, Thank you for your truthful recommendation to coming travelers! I appreciate this a lot. Thanks for touring with me and I wish you a marvelous journey in Thailand. Kind regards, Angmo. Angmo is a delightful, knowledgable, and caring person and guide. Everyone fortunate enough to contract with her will enjoy an unforgettable experience. I recommend her completely. Amal(nick name) is a wonderful guide! Truely, a 5 star experience for our group of 6. She is highly knowledgeable, and willing to custom the tour. We felt privileged and pampered in her tour! Most importantly, she knows how to pace the tour, and listened to our questions. We all left Bangkok with a wealth of knowledge. A terrific day, thanks to a professional guide! Well, what a day. Just fabulous. Angmo arrived to collect me on time, the driver and vehicle we used to get around was immaculate and included a cool box of complimentary cold drinks and cool face clothes. I had asked Angmo to show me the best of Bangkok, not all 'touristy' but with local life too. Angmo exceeded expectation. She is knowledgeable about Thai history, religions and she quickly worked out my learning style and interests. We had great fun, a fabulous lady. I will be back!! Angmo provide us with an outstanding customized tour of Bangkok to fit our limited time there. Great English skills, knowledge of Bangkok/Thailand and a great sense of humor. By the end of the day you felt as though you had known here for a long time. 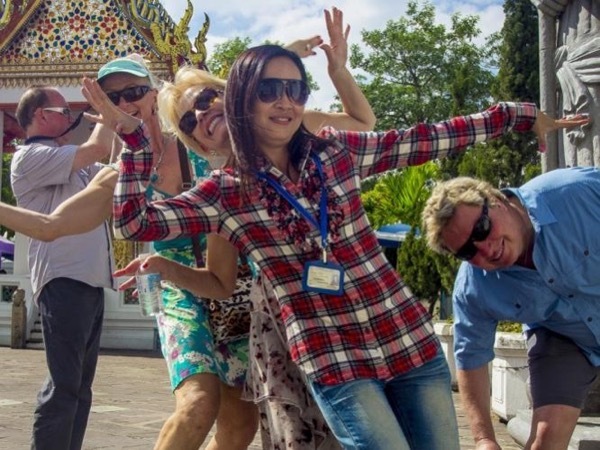 For a grand tour of Bangkok while having fun, you should book one of Angmo's tours. Our guide and driver were very accommodating in designing a tour to suit our interests and preferences. Angmo is very knowledgeable about Thai history and culture, and knows many of the shopkeepers and local artisans we visited. She took many photos of us on our tour and sent them to us shortly thereafter. Her driver was excellent; the van was very clean and comfortable. What a wonderful day - a highlight of our recent cruise and I cannot recommend Angmo highly enough. The tour was flexible and yet with the odd surprise - which I will not mention for fear of spoiling the pleasure for future guests. The transport was very comfortable and our driver did a great job of getting us back to the port for our ship. You will not be disappointed if you book a tour with Angmo. Thanks again. I found Angmo to be a terrific tour guide who was always concerned with our desires. She took care of us like we were a member of her family. Our visit to a Tiger Preserve to interact wit a Baby Tiger was a highlight of our trip. I like to think of myself as a sophisticated and experienced traveler and I would recommend her to all of my family and friends who visit Bangkok. TOUR GUIDE RESPONSE: Dear Jim, Thank you very much for your kind review and for spending 3 fun days together with me in Bangkok, and giving me the chance to introduce my fascinating city to you. Kind regards, Angmo. Angmo is a great guide. She is very profesional and on top of that she is nice and funny. A great experience which I recommend to anyone visiting Bangkok. TOUR GUIDE RESPONSE: Dear INes, thank you so much for booking my tour for your family and of course for writing this 5 star review! It was a great day and I really enjoyed spending it with your family! See you next time in Bangkok! Kind regards, Angmo. Brilliant,humorous and well informed guide. Got us past all the queues quickly,so we where able to see all and more that we wanted to see. Would have no hesitation in recommending her to anyone. Great driver and very comfortable transport as an extra bonus. This is one of the best tours we have been on. Angmo, our guide, and Peter our driver were the very best. We were treated like family. I would highly recommend them for anyone visiting Bangkok. The day was busy, but not rushed. We were able to visit many of Bangkoks highlights and Angmo was well versed in the history of her country. Angmo was amazing! We were like instant friends, and each person in our group raved about her. Would recommend her highly! If we ever get back to Bangkok, we'll book with her again 100%. TOUR GUIDE RESPONSE: Dear Amy, Thank you very mcuh for your raving review! It was great fun to be part of your group of friends for one day! I hope to see all of you again in Bangkok one day. Kind regards, Angmo. My wife and I took a full day tour with Angmo outside the City of Bangkok. This was the first ever locally booked tour for us and we were extremely satisfied with the tour itinerary, our wonderful guide and driver. They met us promptly, asked what our interests were and suggested a tour for us that was above and beyond our expectations. We had a tour to remember and saw some sights that we could never have done on our own. The pace was leisurely and we had time to stop for lunch at local restaurant. 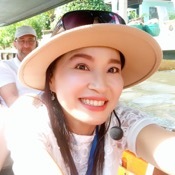 My wife and I enjoyed our 20 year anniversary in October 2015 with "Angmo" (Yaowarak S) taking a 5 day tour of Bangkok, The River Kwai and Ayutthaya. She was terrific. She was gracious to us and attentive to our special requests and specific objectives for the tour that we had in mind. She was very knowledgeable and made our time in Thailand fun and culturally rewarding. TOUR GUIDE RESPONSE: Dear Bill and Laura, Thank you so much for the time we've spend together. It was my great pleasure to be your guide on your special wedding trip! I hope to see you again in Thailand in the future for more great explorations. Kind regards, Angmo. I enjoyed my trip with Angmo to Ayutthaya extremely. I did spend an easy going and relaxed day with lots of history and historic buildings and sites, perfect transportation with a very good and kind driver, an outstanding local lunch, a memorable boat trip on the river with the best captain ever and all this in the company of a knowledgeable, dedicated, friendly woman called Angmo. What a wonderful day! Thank you so much Angmo! TOUR GUIDE RESPONSE: Dear Felix, Thank you so much for your kind review. I will tell my driver and the boat captain that you appreciated their service very much! Thank you for exploring Ayutthaya with me. Kind regards, Angmo. Angmo was a wonderful guide. She was took the time to listen to what I wanted out of the day and then made sure to deliver. It was a wonderful introduction to Bangkok and all its wonders. I will definitely contact Angmo the next time I am in Bangkok to learn more about this wonderful city, culture and country! Yaowarak was great! She put so much energy and enthusiasm in showing us Bangkok. We asked to prepare a very active tour including more things to see than normal. She was very friendly, energetic and made my daughters and my wife feel very pleased. The tour exceeded our expectations. Thank very much! We had a wonderful two days with Angmo. She is very knowledgeable and her passion for the Bangkok area is clear. She gave us a great history of the area and great insight into the current culture. I would recommend her without reservation. And her driver, Mr. Care, provided a very comfortable and safe vehicle. Our tour with Angmo was an absolute delight. We scheduled a custom 7 hour tour with her during our layover in Bangkok. She made sure to get us to the key sights in a timely manner, and was incredibly fun and down to earth. She even accommodated a last minute request to change the location of our food tour. We highly recommend her! We had a fantastic day with Yaowarak. She took my family and I all over Bangkok. She was especially informative on the history and politics of Thailand - we love that stuff! She took lots of pictures of us and was a ton of fun to be around. We can't recommend her enough! The tour she did for the Jackson's, Whalens and my husband and I was spectacular! She is knowledgeable, personable and a great local representative. She made our visit even more special than we had imagined. The driver was also excellent. I will recommend her/your company to any friend traveling to Bangkok. The absolute BEST Tours by Locals experience I have had in the 6+ international cities I have used the service. Angmo was a cheerful, knowledgeable & personable guide that made the day trip to Ayutthaya a memorable highlight of my visit toThailand, Angmo had a beautifully planned day and mixed in the flexibility to adjust to my interests. It felt as thought I spent a day with a friend and was sad to see the day end. Best tour ever. So flexible and knowledgeable. Kind and caring and fun to be with..highly recommend! GREAT TOUR. Angmo customized the tour for us and was very adaptable to our needs. Her English language skills are wonderful -- no problems communicating. She did little things to enhance our tour experience (pictures/information). She is knowledgeable about the things we did/saw, providing lots of insightful information. We had a wonderful time and I would highly recommend Angmo as a guide. TOUR GUIDE RESPONSE: Dear Donna, Thank you very much for the time and effort you took to write this review. I appreciate this a lot. It was my pleasure to give you and your friends a first introduction to Bangkok and Thailand. Greetings from Bangkok to all of you. Kind regards, Angmo. TOUR GUIDE RESPONSE: Thanks for your 5 star rating! Kind regards, Angmo. Only one day Bangkok tour and so many amazing memories! Yaowarak is a great guide giving you a lot of attention. She will surprise you many times. Our tour wit 8 y.o. girl was not overload and focused also for her needs. Highly recommended! Yaowarak better known as "Amor" was so knowledgible about her city, fun to be with and offered many delightful surprises. We simply had a delightful day with her. We had a great day with Yaowarak and appreciated her effort in accommodating our requests and leaving with us with great memories. Angmo is an incredibly talented guide, knowing just how much information to offer at every point. She was really responsive to our interests, tailor-making each part of our day perfectly. She speaks very good English, too, and she's really fun.